I think they only have to have 3 players from the team they represent, rest from their own collection of players. So if you ever wanted to see Ronaldo in a Nix shirt, its probably your only chance. They play with mostly all-star players in their teams, only maybe 2-3 Phoenix players play, so the ratings of the Phoenix players don't make a great deal of difference. Nearly all the 'Phoenix' goals in this will be scored by Ronaldo & Mbappe. Sounds even lamer than I thought! :) but at least it makes for a level playing field which you need otherwise you'll get slammed each game. Yeh earlier they had Krishna, but now both teams have Ronaldo. The viewing numbers are interesting. Looking at the stats on Twitch it does show huge amount of views, over 100,000 viewers but the peak at any one time is only 4,500 (the whole round is done in one stream which goes just over 4 hours). The average amount of time viewers watch for is only 4 or 5 minutes. Are the referees just as biased and shark in the E League as they are in the A League?? Why can't they fill each team with players with exactly the same abilities and just rename the players? Or is that not possible? Winners of these games head off to represent NZ at the Worlds iirc. 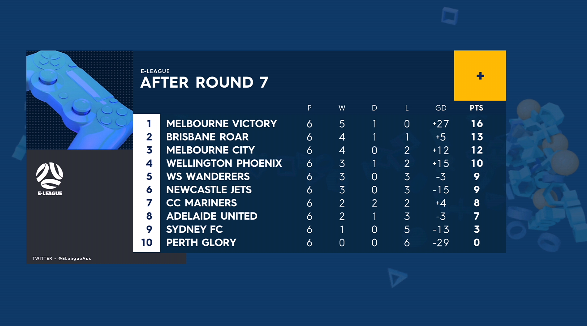 Here's the @ELeagueAus ladder after Round 7!